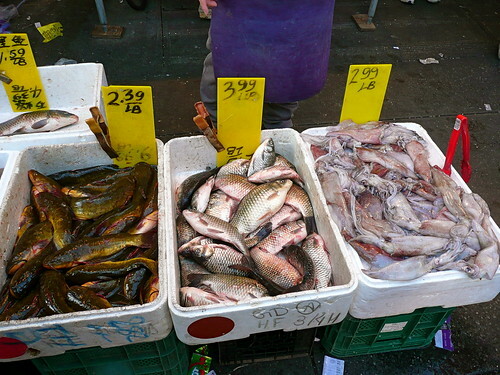 These fish were still alive, originally uploaded by rembklyn. You can't say the fish aren't fresh on 8th Avenue. Nor are they expensive. Thanks to rembklyn for adding this to the Best View in Brooklyn photo pool! I am a huge fan of tropical fruits. Which is the best fruit market in Sunset Park, with the best selection? I am looking for Mexican guavas, but cannot find them in Bay Ridge. A lot of the bodegas and Mexican groceries have a selection of fruit. Come have lunch at Tacos Xochimilco on 5th and 45th and wander into several places around there. I'll ask a couple of people where the best stuff is. I will check that place out, thanks.